Without action to back it up, “solidarity” is a hollow chant. Similarly, a group can issue a hundred statements on a hundred different topics and none of them will mean anything without a carefully planned political action. 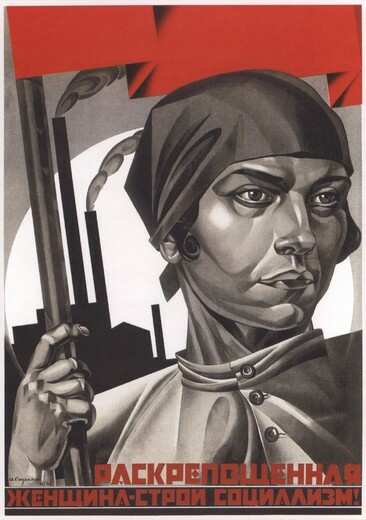 This holds true for every political action undertaken in the context of the anti-imperialist struggle, without exception; a political line which is able to recognize sharpening contradictions among the imperialists, but refuses for whatever reason to participate significantly in the mass movements, risks political paralysis. In the spirit of combating paralysis in politics, we must never forget the movement in the streets of the U.S. cities is the same movement which outlasted the Zionist siege in Gaza. We know we march together because when we have one common enemy, the monstrous U.S. regime which runs rampant all over the world, our ranks will close. It is not a bond of words, but of deeds and accepting political responsibility above all. They are our comrades because we are theirs. Engaging in politics of this sort is precisely what can elevate the level of resistance, of struggle, against the class enemy, including winning the leaders to the Party organization and socialism. Historic events now test both the U.S. regime and its apartheid client-state, Israel. In the streets of Gaza, armed comrades are fighting while outside Palestine comrades take up the calls for resistance issuing from Gaza. In the U.S. city of Chicago, an impressive series of actions have taken place since the renewal of Israeli aggression in July. Chicago is of particular importance as a city with a large Palestinian community as well as a stronghold of U.S. capitalism, reaction and gangster politics. The first actions on 7/9 and 7/13 each drew over a thousand, the latter action being significantly larger as the death toll in Gaza rose, and with it the indignation the people felt towards the war criminals, and greater still the resolve to do something to hold these criminals of the capitalist class responsible. This resulted in the 7/16 action which was intended to be a national day of civil disobedience to signify solidarity with the Palestinian people. Although the call for civil disobedience actions around the country originated with the liberal Jewish Voices for Peace group, only a single civil disobedience action was undertaken in Chicago, while “die-ins” took place in other parts of the country. 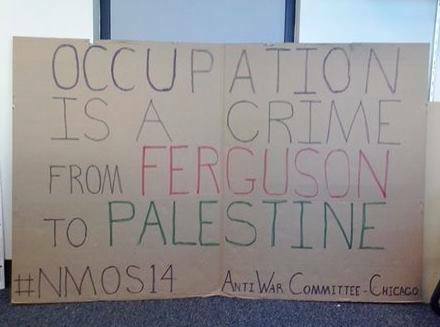 The 7/16 action in Chicago targeted Boeing, a BDS target and supplier of arms to Israel headquartered in the city. The Chicago Anti-War Committee (AWC), having consistently elevated the struggle against arms manufacturers in the city of Chicago, ensured Jewish Voices for Peace (JVP) were able to carry out their planned action in Chicago. Of the five activists arrested, two were from JVP and three from AWC. 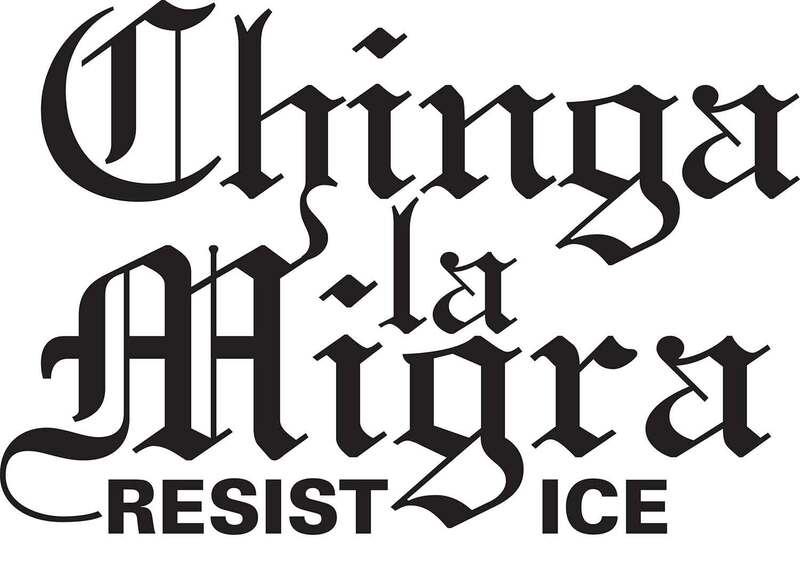 In the moments immediately after the arrests, including at the jail solidarity which followed the 7/16 action, participants expressed satisfaction in the fact that the movement was prepared to move beyond marches, to face arrest and its risks. A demand began to exist for a new, more militant form of protest, and so the character of the movement altered from mass marches to the “die-in” strategy, and where possible acts of civil disobedience. On 7/20 the Popular Front for the Liberation of Palestine (PFLP) released a statement calling upon all Palestinians to intensify the resistance, in the occupied territories and in the Diaspora, strongly emphasizing unity in the face of Zionist aggression, they urged the occupation of the offices of Zionist embassies, consulates and war manufacturers. By the time of the next action in Chicago on 7/27, the people were taking the streets with over fifteen thousand demonstrators, a number rivaling the sizeable anti-NATO protests which took place in Chicago only a few years before. The large showing was helped on by an impressive show of support from the Puerto Rican community in Chicago, which linked the occupation of the two nations via their mutual foe in U.S. imperialism. A key stopping point at the rally was Boeing headquarters, the site of the Chicago civil disobedience action on 7/16. This is notable because during the last attack on Gaza, Operation Cast Lead, Palestinian demonstrators did not target Boeing, but now the corporation has become a consistent target of BDS, as well as a more and more immediately recognizable face of localized capitalism-imperialism that can be confronted by the wider movement. Billed as a press conference at city hall, the next action took place on 7/30 as a die-in in the style of those taking place in greater and greater numbers since the 7/16 action. The die-in at city hall garnered much local media attention and without hesitation named Boeing as Chicago’s chief collaborator in the genocide of the Palestinian people. Shortly after the press-conference in Chicago another statement was released by the Popular Front for the Liberation of Palestine on 8/3 in which the PFLP again called upon Palestinians to intensify the resistance, but also named examples of resistance outside of Palestine, specifically the city of Chicago. At her court date on 8/5, Anti-War activist and one-time Peace candidate for Boeing’s board of directors Kait McIntyre was given stiff penalties by Beoing’s prosecutors for her participation in the 7/16 action, including a fine and a court order banning her from Boeing’s Chicago property. This is the fearful reaction of a criminal company fully aware it could never survive amidst the tempest of criticism and protest the movement will unleash as it grows. It is only the first stirrings of this movement, yet it is enough to inspire Boeing’s overly-anxious reaction. 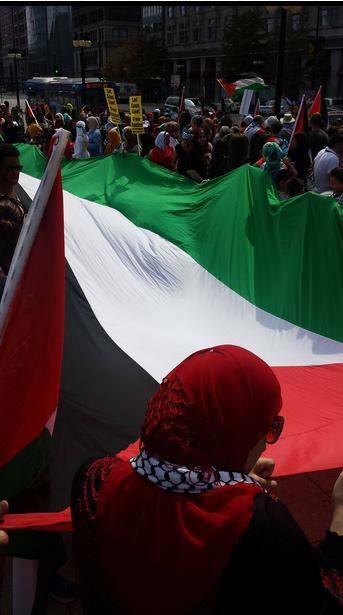 In an impressive show of anti-imperialist unity, the final rally for Gaza in Chicago took place on 8/10. No longer were there U.S. flags in any significant number, in their place were the banners of true allies, such as Puerto Rico, the Black Nation, Cuba, the many progressive peoples of Asia, Africa, Latin America and all nations all over the world who have been oppressed by U.S. imperialism and its puppet regimes. This crowd of eight-thousand had learned something of the nature of U.S. imperialism, and something of the nature of unity. This brings us to the 8/14 action, a rally not for Palestine, but to observe a moment of silence for the murdered Mike Brown of Ferguson, Missouri and to call attention to the severe epidemic of the murderous cops restlessly stalking our streets day-and-night. 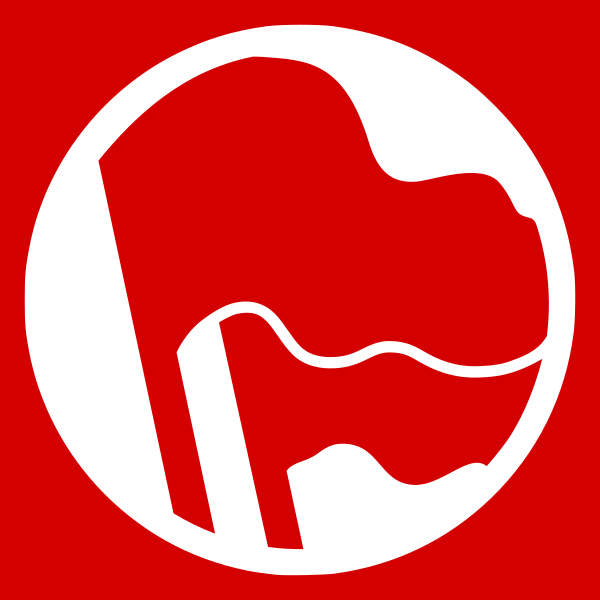 ‹ International Conference of Marxist-Leninist Parties and Organizations: Imperialists and your henchmen: Get your filthy hands out of the Middle East!